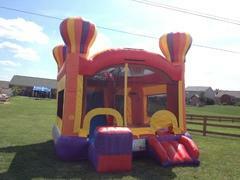 For the best combo bounce house rentals in Datyon, Kettering, Springboro and the surrounding areas, there's no reason to look any further than Dayton Inflatables. 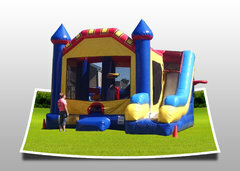 We proudly offer one of the largest selection of bounce and slide combos around. Having trouble deciding between a jumper and a water slide rental? Why not have the best of both worlds? 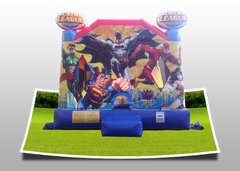 Most of our combo bouncers can be used wet or dry, and they are perfect for backyard birthday parties, school field days, corporate events, church picnics and just about any other event you can imagine. 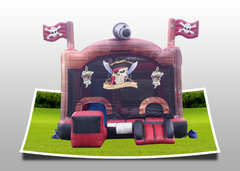 The best part of our combo bounce houses is the fact that there is typically a constant flow of participants. 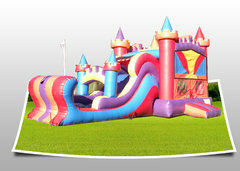 Simply enter the bounce area, jump for a while, then climb up the slide to the exit at the bottom. 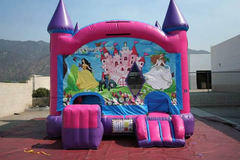 This makes these combo bounce house rentals perfect for large events. All of our equipment is designed to meet or exceed industry safety standards and our staff also cleans and sanitizes every item before your event. Get ready to take your event to the next level with our Ferris Wheel Combo. 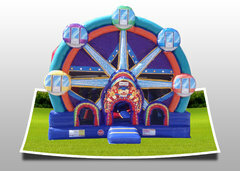 Your guests will feel like they're on the carnival midway with this beautiful, eye-catching bounce and slide combo. 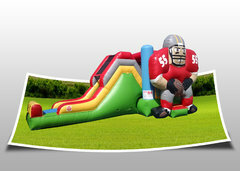 Having a football themed birthday party or looking for something to keep the kids busy during the big game? Score an extra point with our Big Buck Combo. When you order this massive unit, you're sure to be the MVP of your party. For the train lovers, hop aboard our Choo Choo Train Combo. 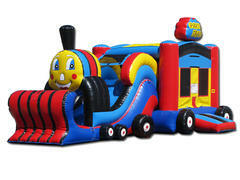 Your guests will enjoy the fun of bouncing and sliding on this locomotive for hours of fun. 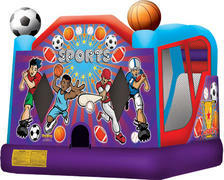 Our concession machine rentals make a great addition to these inflatable combo bouncers. 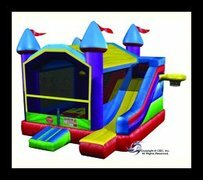 When it comes to the best selection of combo bounce house rentals, nobody comes close to Dayton Inflatables with selection and service. Take the stress out of your next party or event with us. We proudly serve Dayton, Kettering, Springboro and the surrounding areas. Browse the selections below and click the image or title for more information and to request a quote. We welcome all questions, so please contact us for inquires and orders.